Depending on where you are right now in the world, there’s a good chance you’re enjoying/enduring (delete as appropriate) the same sweltering heat and blazing sunshine which is currently scorching us here in the UK, and perhaps you find yourself wondering, as the earth around you slowly returns to its molten, primordial state… what albums provide the best soundtrack to my current situation? 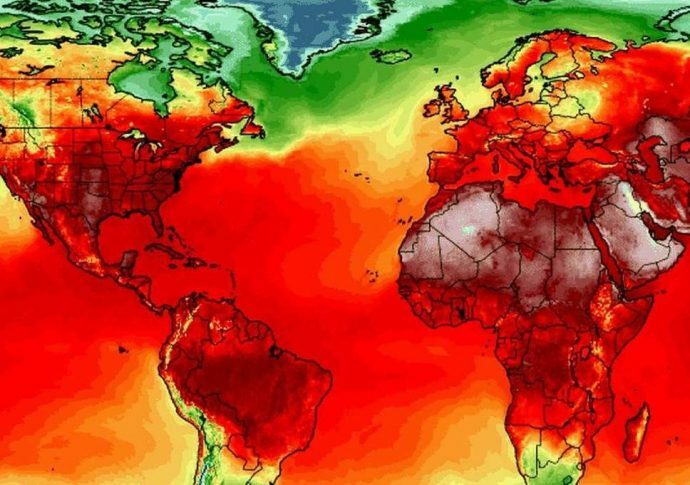 After all, while a lot of Stoner Rock/Metal bands have built a career out of an association with lazy, sun-kissed vibes and hazy, weed-fuelled riffs, the majority of the more Extreme/Underground bands we cover here at NCS tend to be more associated with darkness and shadow… heck, about 50% of all the world’s Black Metal bands are obsessed with snow and ice, regardless of where they actually hail from… and there’s a reason we so often use words like “dank” and “cavernous”, “chilling” and “frostbitten, to describe their music – it just fits! The first couple weeks of the new year often feel like a machine slowly lurching back to life as people wake up from their respective holiday binges and try their damndest to shake the rust off, kick the tires, and get things back to into gear. Both the news and the writing fronts often have that same year-opening feeling of machines lurching back into life after a couple weeks of dormancy — in the case of NCS it’s because we buried ourselves in the yearly Listmania event in which numerous lists of albums toppled over each another like the zombie anthills from the World War Z (in name only) film. There’s a certain sort of apocalyptic reverie one takes on as a state of mind when reviewing an Ulcerate disc. The now long-running New Zealand-based death metal three-piece have made a career out of creating music that sounds tailor-made for the end of the world. 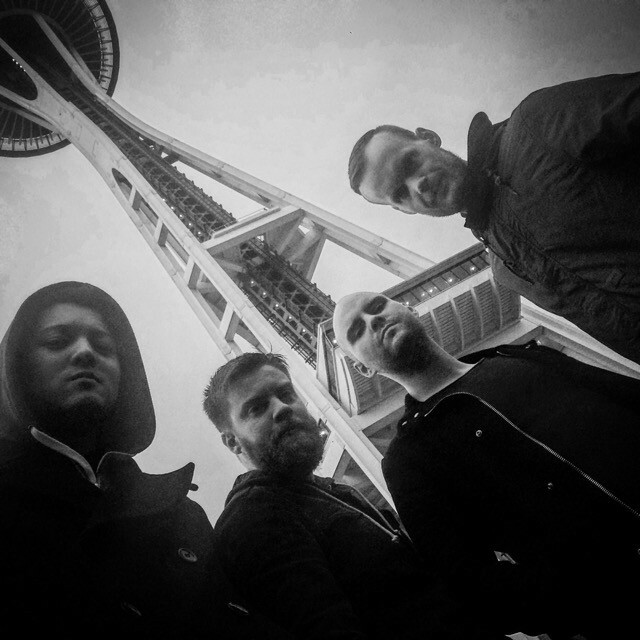 When the Earth’s crust is rended asunder and magma comes shooting up into the air, Ulcerate are one of the groups that I am expecting to provide the mood music, like the band playing on the Titanic, on a planetary scale. Keeping in mind that among the group’s discography are albums with names like Everything Is Fire and The Destroyers Of All, you can see why that description might feel apt. 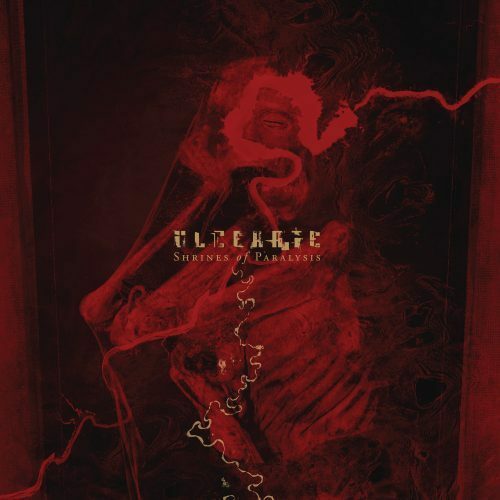 Ulcerate play a deafening form of death metal, one that is largely cavernous and often cataclysmic in its impact. 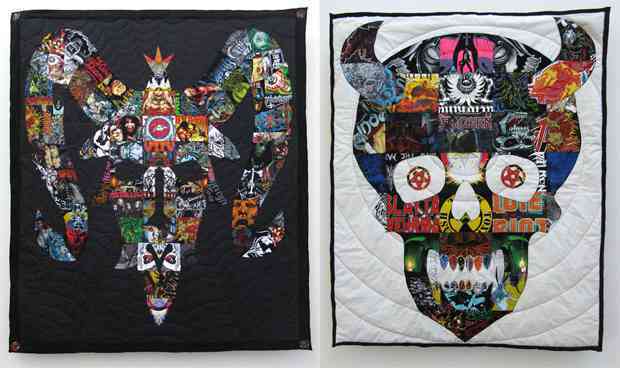 They have grown in popularity over the years and have become a cultural landmark in the death metal scene as a whole. They are able to channel utter destruction in their sound and have done so for quite some time. On November 2, the Shrines of Paralysis North American Tour launched in Los Angeles, headlined by New Zealand’s Ulcerate and also including the Icelandic band Zhrine, and Phobocosm from Montreal. 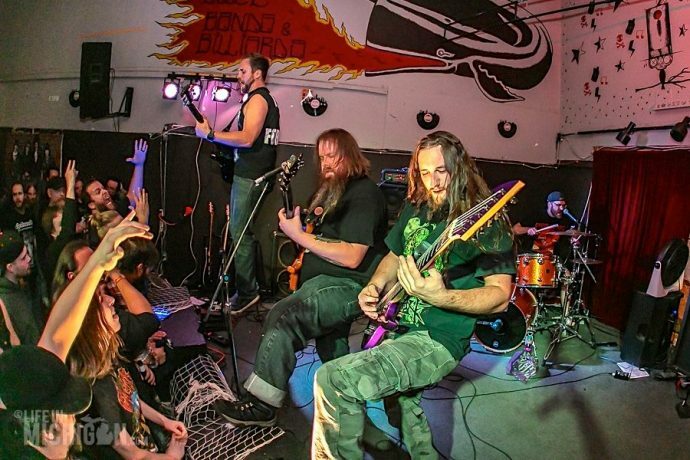 Zhrine was one of the biggest and brightest surprises at this year’s edition of Maryland Deathfest (as we discussed here and here, with photos), and now large numbers of other metal fans are getting the chance to discover what makes Zhrine so special. And so we count ourselves very fortunate to bring you the first in what we hope will be a series of tour reports from Zhrine’s manager Bogi Bjarnason (accompanied by his photos) — though as you’ll discover, it may be the last as well as the first. This is one of those days at our site when virtually the entire day will be devoted to our own premieres of new songs and full album streams. There will be four of those ahead. But before we dive into those, I have to share this one new song that premiered not long ago at another site (CLRVYNT). DGR volunteered for round-up duty while the oaf who usually does this was furiously scribbling introductions to premieres over the last 48 hours. Said oaf is now working on his own round-up contribution, which will become Part 2 of this post later today. Meanwhile, here are DGR’s picks for noteworthy new songs and videos that emerged in recent days. I don’t do a very good job posting about new tour announcements, even when I’m really excited about them. But I’m REALLY excited about this one, and happened to have a few free minutes to help spread the word. 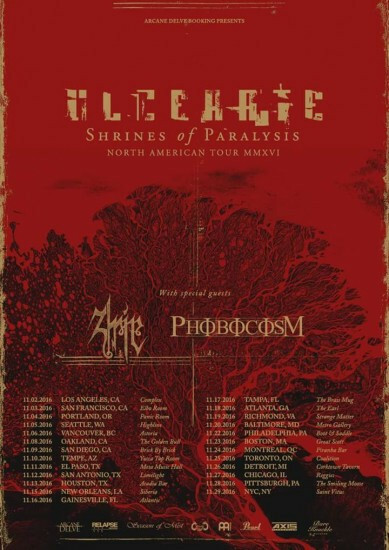 The name of the tour is Shrines of Paralysis, and that’s a well-chosen name because the tour is headlined by New Zealand’s Ulcerate and will also include Iceland’s Zhrine and Montreal’s Phobocosm. And that is one hell of a line-up. Though my erstwhile compatriots may have been attending the sun and shenanigans of California Deathfest without me last weekend (seriously, where was my invite? I thought we were friends!?!) that doesn’t mean that yours truly was without suitably metallic diversions of my own, as I was lucky enough to bear witness to the titanic Death Metal maelstrom known as Ulcerate rolling through my town, leaving a trail of shattered lives and lacerated ear-drums in its wake. The story gets even better though, as the New Zealend three-piece were accompanied on their pilgrimage of pain by gloom-heavy doomsters (and perennial NCS darlings) Bell Witch and uber-riff-mongers Ageless Oblivion (whose album Penthos I picked as one of my absolute favourite releases of last year). Not only that but the venue they played, The Chameleon, is the sort of intimate, DIY place that packs a lot of character, and a frankly massive soundsystem, into a very small space, meaning there’s nowhere to hide from the overwhelming onslaught of sonic punishment unleashed by the bands. It seems like we often (and deservedly) praise bands for having a multitude of influences, for having a multi-faceted and varied sound, for achieving synthesis of diverse and disparate elements and using them to create a unique core identity for themselves. Heck, one of the key ways (although far from the only way) in which Metal progresses is by incorporating new sounds and influences, new styles, into the core genre, so it’s not surprising that we often laud those bands who bring something new, something fresh and exciting to the table. After all, lack of breadth and variety in a band’s influences often does tend to lead to repetition and stagnation. If your band is happy to describe yourselves as “like Meshuggah” for example, then it’s odds-on that you’re probably just going to sound like a lesser-copy of the Swedish cybernauts. Just as if you’re a Thrash band and your only influences are other Thrash bands – and usually that means going back to the same tapped-out well as every other band – it becomes less and less likely that you’ll be pushing the genre forward, rather than simply rehashing or reworking what’s gone before (not, let me add, that there’s always anything intrinsically wrong with that). Yet we also have to be careful about praising bands with too many influences wholesale. It’s certainly possible for bands to go overboard with their disparate influences and styles, and end up a directionless mish-mash of bits and pieces of other bands, which never really cohere into a greater whole. I was separated from the interhole for most of yesterday and therefore missed a lot of breaking news. While attempting to catch up, one of the first things to catch my eye was the tour flyer you see above, waiting patiently in my in-box like a viper ready to strike. 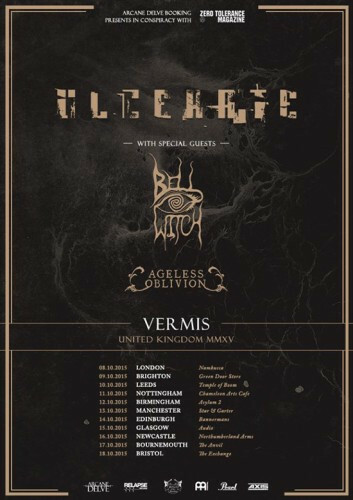 To spell it out, New Zealand’s Ulcerate will embark upon the Vermis North America MMXIV tour beginning in Los Angeles on May 1 and finishing with an appearance at Maryland Deathfest on May 25. 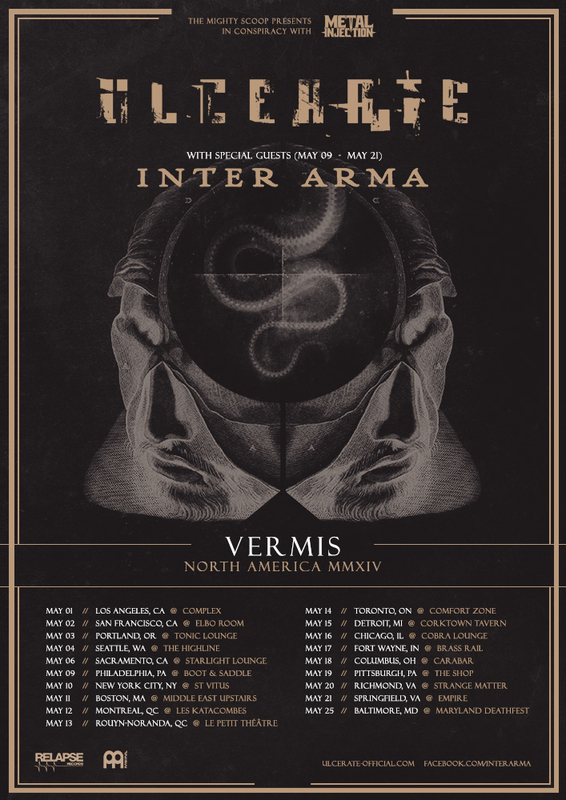 That’s tremendously exciting news, but it gets even better, because Virginia’s Inter Arma will be along for the ride on most of the dates. They will join the tour in Philadelphia on May 9 and continue until the final date before MDF.